EA's recently announced Need For Speed Shift 2: Unleashed is again a step away from the arcade style action racer. Despite the rather outlandish title, this is a racing sim more in line with Project Gotham Racing or Forza (maybe even Gran Turismo) than the more traditional Need for Speed titles. London-based Slightly Mad Studios is once again taking over for this off-shoot brand, and fans of the original Shift title should have a lot to look forward to. There are some neat little additions, such as the new helmet cam, that will hopefully set this racer ahead of the pack made up of Forza and Gran Turismo. That's some hefty competition. Follow for my hands-on with the title. Like I said, there is now the rather unique helmet cam. I know it sounds weird, and I know it really shouldn't be something for me to be excited about, but it is pretty much the niftiest addition to the game. Much like the constant struggle between the uncanny valley and physical realism, I personally have had problems with the in-car camera for racing games. While normal first-person cams certainly looks like they should be realistic, they don't truly feel like driving a high performance vehicle. Slightly Mad Studios apparently feels the same, so they've come up with a car camera that really, really excites me. The helmet cam is equivalent to attaching cameras to the sides of a race car driver's helmet, and as his head wobbles back and forth due to the inertia of the vehicle. The camera will swing down and outward with each turn, and every bump against cars or off the road will cause a jostle up and down. It's incredible dynamic and realistic, and while it's not the most important element of the game, it's a nice surprise to find. Unfortunately, I wasn't given too much hands-on with the title. 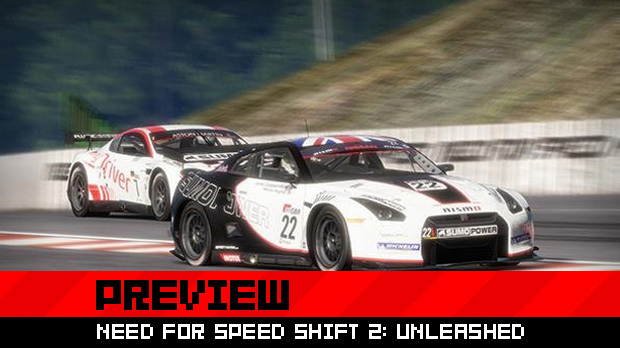 From what I played however, Shift 2: Unleashed looks to be a very solid sim racer, with guide lines on the road to guide fresh players, and a dynamic weather/road system. As cars race around the track, the road will take damage and create a dynamic. Cars take damage, which is especially notable during the night. When your headlamps go out, night races are even more difficult. Addressing complaints against the original's lack of variety of modes, Slightly Mad has added more modes and types of events for players, and the Need for Speed Autolog is integrated. Those who like to master every track and know every detail of their races will dig this. Visually, Shift 2 unleashed is gorgeous. Using an updated graphics system, the developers were really able to push some impressive effects. 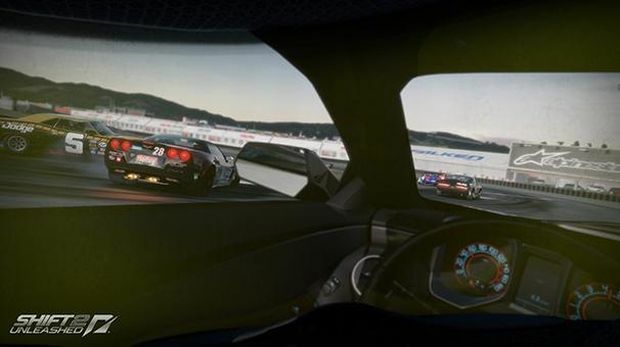 From the inside of the car with the helmet cam, the player can see that light bends and shifts with realistic shadows created by the frame of the car. Even more impressive was the night versions of the tracks, as the points of light stretch and star much like they do with real windows. Wet tracks create reduced visibility, and the game uses focus and out-of-focus elements to create a real keen sense of depth. Interestingly, like many games this late in the console cycle, Shift 2 Unleashed is being developed with the PS3 as the primary platform, and while the game has a rather soon release date of Spring of 2011, Slightly Mad is making some bold claims. 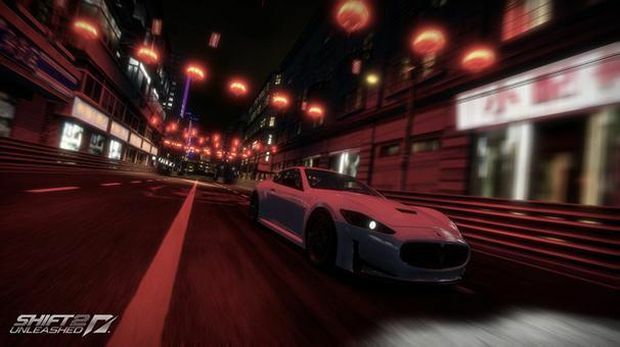 “We want to beat Gran Turismo 5 and Forza” declares Executive Producer of Shift 2 Unleashed, Marcus Nilsson. An impressive goal indeed, we'll have to see if EA's latest racing endeavor will make it king of both arcade and sim racing games.